If you would have told Montana fans before the game that Derek Selvig would be held scoreless and Kareem Jamar would score 9 points on 2/10 shooting, I'm not sure many of them would have thought they could have won the game. However, that is exactly what happened, thanks to a career day from Mathias Ward. He scored 28 points on 9/11 shooting (becoming the conference leader in FG%) and was 10/13 from the line. He has a great touch from the field, and feasted on EWU's lack of big men (especially since they get in foul trouble so often). "It definitely makes a difference when you can be the bigger person in the matchup, you can use angles and use your strength more than with other big guys," Ward said. "It was a lot of different things - my teammates were looking to get me the ball, I hit a couple of jump shots, I got a couple of easy ones, so I kind of got it rolling." 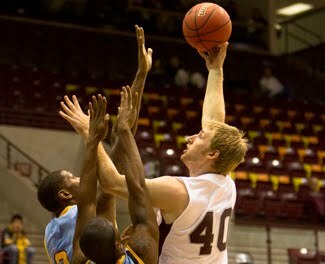 The other star was Will Cherry, who had 22 points, 6 rebounds, and 6 assists. He also got the line 13 times. For Eastern Washington, it was some of the same problems we have seen from them throughout the year. First, they hacked the Grizzlies all night, committing 26 fouls and sending Montana to the line for 37 FT attempts. It is very difficult to win when you consistently put other teams on the line as much as they do. One EWU message board compiled the stat that they have committed 92 more fouls than their opponents, resulting in 182 more FT attempts. After 14 games that is just unreal. They also struggle with ball movement. Collin Chiverton can be a ball stopper, as he has 9 assists in 14 games (but takes a higher percentage of his team's shots than anyone else in America). EWU had 7 assists on 25 baskets in this game, ruining a great performance by Cliff Colimon. At the end of the day, Montana's pick as #2 seems justified, as they improve to 2-0 with a quality BSC win. At the same time, EWU at #3 seems about right too, as they led at half and played the Griz tough. These are two quality teams. Not sure if EWU's new coach is going to be able to make the adjustment to NCAA Division 1 from Division 3. During the game it looked like the players were in charge, not their coach. We were definitely the better team and the result showed that. Eastern could be pretty good though down the road.